Sarah and Serena are sisters who lost both parents to HIV/AIDS. As young orphans, they and their younger brother were adopted by an elderly couple. While this situation is deeply preferable to living on the streets, their foster parents are too old to adequately care for the three children. Serena, ten years old, is in her second year of elementary school. Her sister Sarah is thirteen, but because of frequent illness due to HIV/AIDS, she is in the same grade as her younger sister. Both children have been stunted physically and mentally by malnutrition. YEGO has identified both girls as orphaned and vulnerable children (OVC), but lacks the funds to provide anything more than basic counselling services. However, as funds become available, it hopes to start by providing food security for the children, and then if possible, to support their education by providing tutoring and financial assistance. 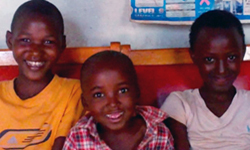 To help Sarah and Serena and other children like them, please consider helping YEGO Rwanda today.